Introduces students to the use of biochemical characteristics for differentiating 4 closely related bacteria. Using their collected data, students then identify 1 of these bacteria labeled as an unknown. For a class of 30. Introduces students to the use of biochemical characteristics for differentiating 4 closely related bacteria. Using their collected data, students then identify 1 of these bacteria labeled as an unknown. Citrate utilization, hydrogen sulfide production, butanediol fermentation, and mixed acid fermentation tests are conducted. Tests are completed in 5 days. Note:Keep bacteria cultures and agar at room temperature; do not incubate or refrigerate. 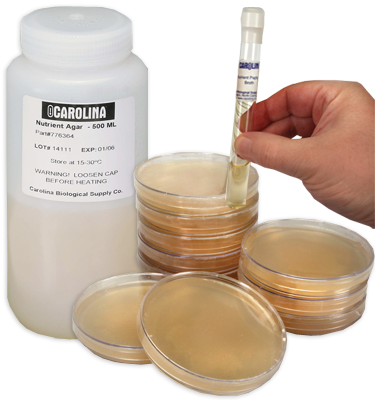 Keep agar and reagents at room temperature.